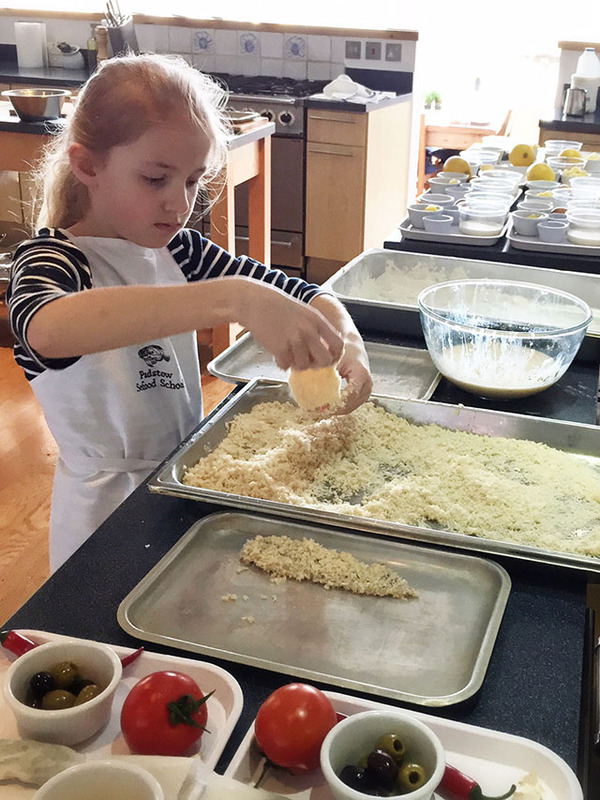 My eight year old daughter, Sophie, is an enthusiastic helper in the kitchen. Hardly a day goes by when she doesn’t ask to cut or peel vegetables, stir the contents of a saucepan or bake a cake. In her eyes, the sharper the knife or more dangerous the task the better. So when Sophie was invited to spend a morning at Rick Stein’s Padstow Seafood School, as a Barefoot Cornwall representative, she was extremely excited, and I went along with her to take photos and chat to the chefs. 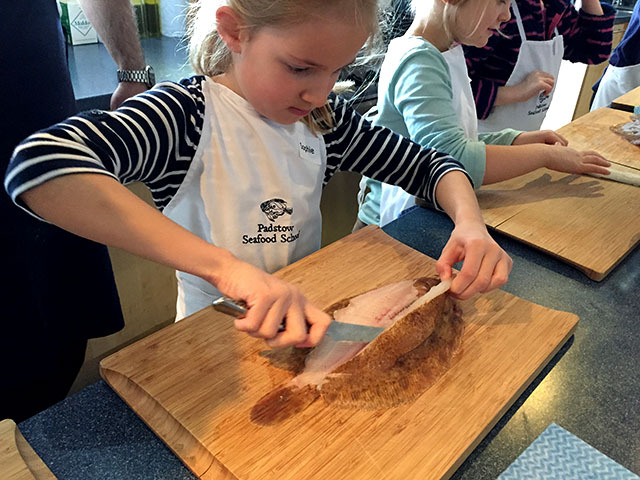 Padstow Seafood School runs several half day courses for children, and Sophie was enrolled on the course for 8 to 11 year olds. There is also one designed for 12 to 16 year olds, as well as several seasonal baking courses. 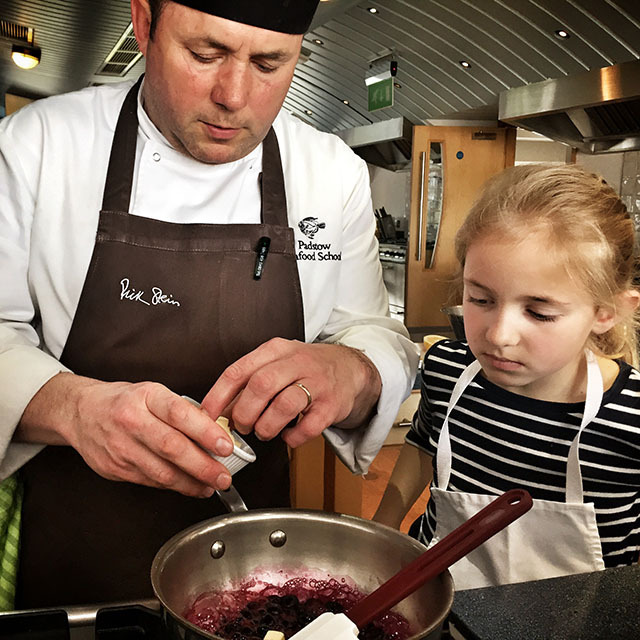 Upon arrival the children (five girls, one boy) sat around the large dining table where they were greeted by Jean-Baptiste Sancey, Senior Chef Lecturer and Mark Puckey, Head Chef Lecturer. 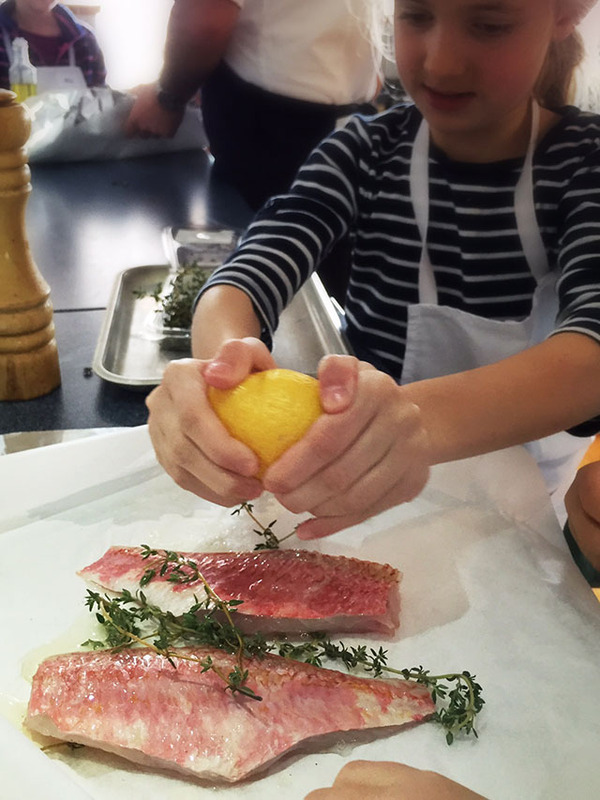 First Jean Baptiste showed the children how to make lemon sole goujons with Parmesan breadcrumbs. This included filleting, trimming and slicing the sole (above). Then it was the children’s turn and, amazingly, they all did a pretty good job. I liked the “double dipping” technique, which definitely led to an extra crunchy coating. Sophie was delighted to use a deep fat fryer for the first time (and has since asked for one for her birthday). The finished article was delicious. The children all sat around the table and tucked into their starters with grins on their faces, so happy with what they had created. I loved the way Jean engaged with the children during the demos, making them laugh with comments such as “Kitchens are full of dangerous things: sharp knives, hot oil, spicy chilli and scary chefs” and “Chefs, we’re going to make the plates look super cool”. 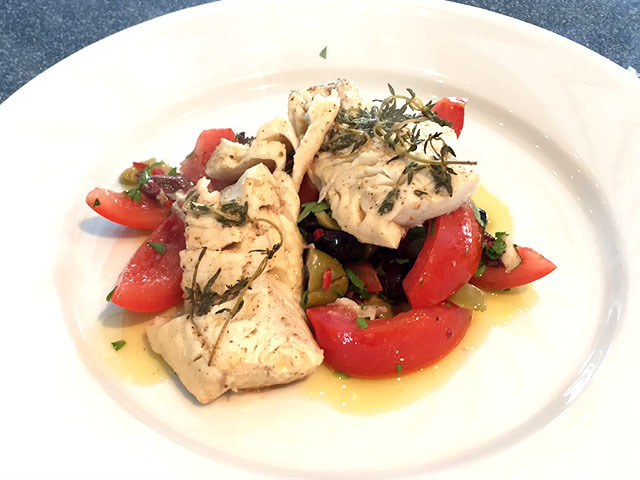 Next on the menu was red mullet en papilotte with thyme and a salad of tomatoes, olives, chilli and parsley. 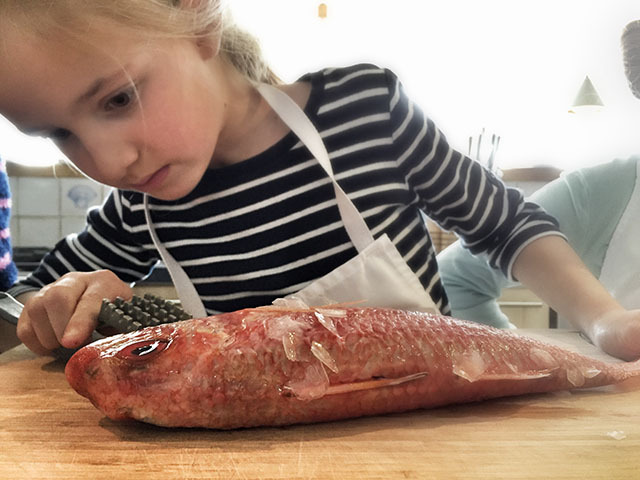 Jean taught the children about its fins and bones and demonstrated how to give a red mullet a “shave, wash and haircut”. There were a lot of ughs and yuks as the children gutted their fish. They descaled and trimmed them, and chopped off their heads with delight. Next came pin-boning and filleting before the fish were wrapped in parcels for steaming with oil, lemon juice, wine and herbs. Again the children took their finished dishes to the table and were given baskets of fresh bread and hot chips to accompany their meal. Washed down with jugs of squash they really were very content. 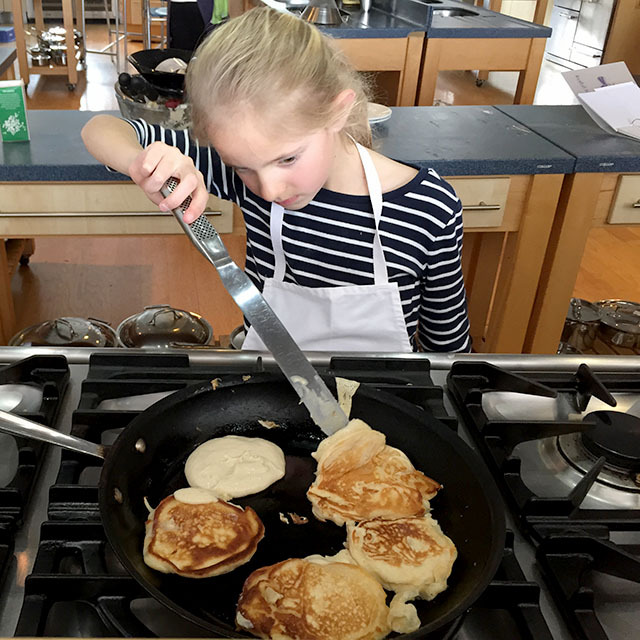 Dessert was taught by Executive Pastry Chef, Stuart Pate (above left), and the children were understandably excited about making buttermilk pancakes with blueberry and lemon butter. Following Stuart’s instructions, they mixed the thick batter and prepared the delicious buttery compote. Ladles dripped batter everywhere, and some even went into the hot pans. The pancakes were served with rich vanilla ice cream and were demolished by the children and their waiting parents within minutes. At the end of the course the children were presented with a certificate of attendance and recipe folder. They all had such a wonderful morning and the only disappointment was that Rick Stein had been in the office next door and not popped in to say hello! 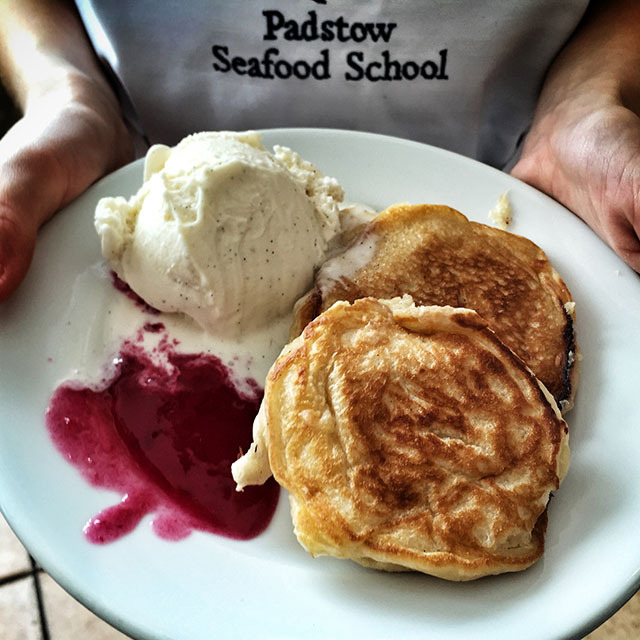 Thank you to chefs Jean Baptiste, Mark, Stuart and all the staff at Padstow Seafood School for looking after Sophie so well. She learnt so much during the morning, and before we left Padstow she insisted that I bought some fish from the fishmonger. 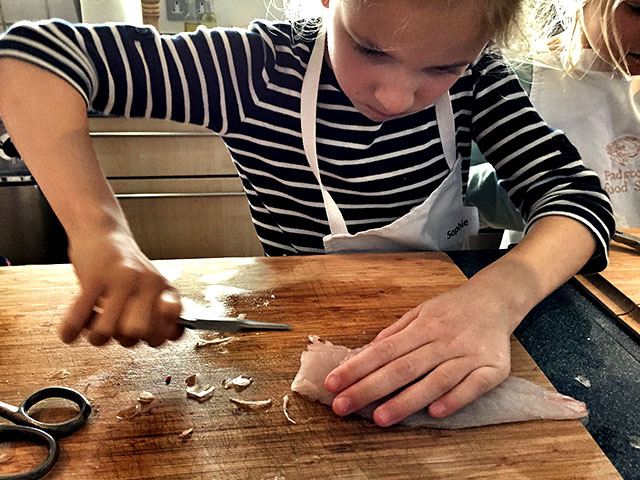 That evening she put her newfound skills to the test by single-handedly filleting three lemon sole and cooking goujons for the whole family for supper. 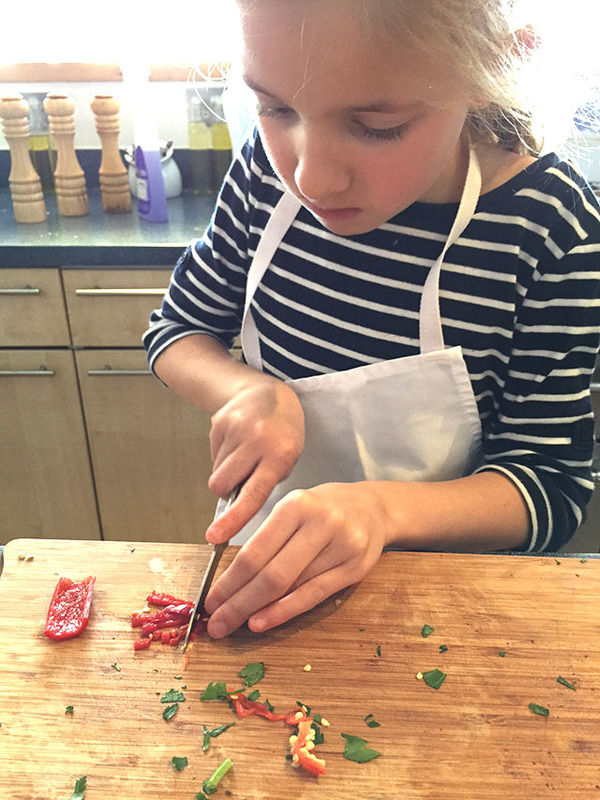 The next children’s cookery courses run on 29 July and 13 August. 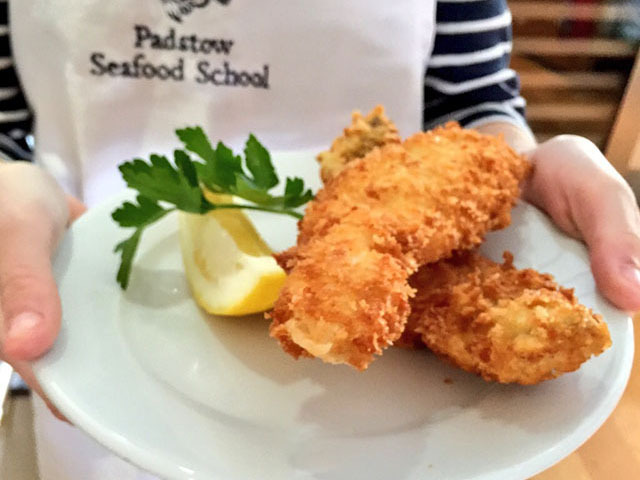 For more details please visit Padstow Seafood School’s website. Prices start at £72 per child.